This is surely a good strategy for blue+ but once you hit purple + it is insane. Also the fact that pretty much every stage you must face warchief. If your using warchief and he goes down once in the first few stages, he cannot revive himself if he's done so already, which makes using him pointless if he's already been downed once in any previous wave. If he finishes a wave, he should be allowed to revive in following waves, especially if you're going too be facing 14-15 War chiefs during your crusade. LM at 50 in epic it is really powerfully, but there is the Succubus too. Last edited by heroeszabi; 11-16-2014 at 09:25 AM. Last edited by aluriasoria; 11-17-2014 at 07:55 AM. I set a single lvl 1 for defence and have found for the past week I find lvl 70+ is in the first five lvls of crusade. Is it normal to battle yourself in crusade also? I have been completing crusade for the past 2-3 weeks without a miss, sometimes I don't even lose a hero. A Death Knight is really a must! Preferably same as your team level ( or close to) and with good items/enchantments, so best to hire the most expensive DK you can find at your mercenary tab. At the start of Round 1, I use Commando+Chaplain+Imperial Executioner+Old Curse+Death Knight. Use the lower levels to recharge their energies. Depending on the remaining HP after the fights, I only swap out the Commando if the next fight round has no enemy commando. I swap out OC too to put another hero for energy recharge. So max I take out and put 2 new heroes (any DPS like Succubus, Wind, etc) in order to at least secure the later stages if in need of burst. When there is an enemy commando, I timely activate the DK ultimate skill (if it is available) to dodge the stun. Most enemy setups run a Warchief, OC and commando (little or no diversity at all). With me having a commando too, the enemy WC gets bursted down fast. Before he gets back up, I burst down the enemy OC with my Imperial Executioner ultimate (very high magic crit chance, 11-12K is common). The rest is relatively easy. The CC skills from my IE and OC are enough to lockdown any enemy hero. I sometimes clear crusade with just these 5 heroes, although I feel much secure filling up other heroes' energy bar for backup in case I screw up in the later stages. I am level 72 with HC on purple. 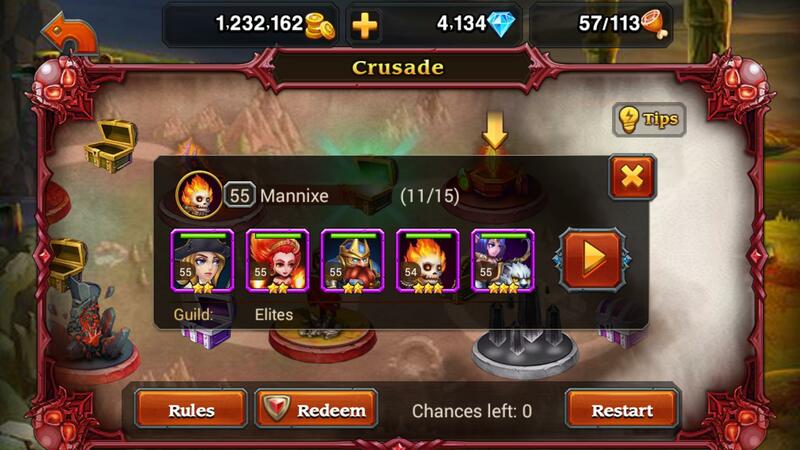 When doing the crusade I have notice that I have to face level 76, 75 and above on some of the stages. 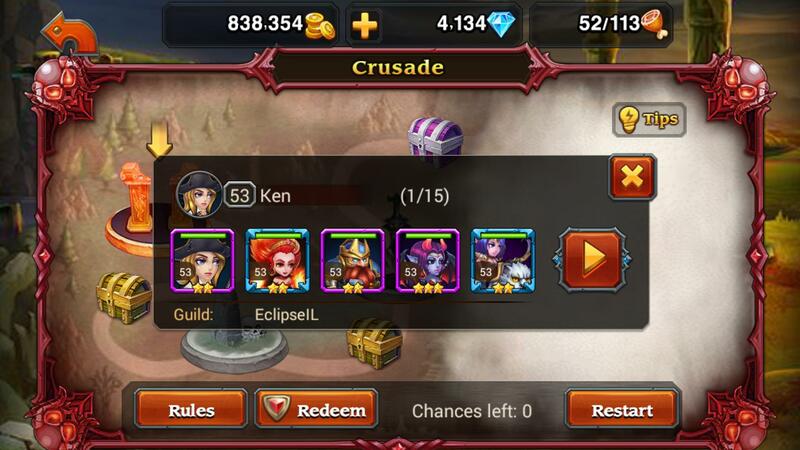 Even if I try 5 team formation upgrading every heroes I will come short to the crusade. How can this be possible? I would understand if the last 2 or 1 stage would be 75 but not 6 different stages whose level are 3 to 6 level higher. No matter how many stones you buy to upgrade your heroes but it will not suffice. I wish the admin should be looking into this issues. The game should be strategy and fun and with a some challenges but not frustrating. It will be a waste of time and money when this crusade will not be resolve. Hi, my heroes are all lvled at 44, and I'm facing lvls 51s at stage 11/15 ..... I can't ever compete with those purple and it's impossible even if I have 10 heroes for 2 teams. I feel really helpless. Can the admin pls help? I think it´s based on your account lvl. It might depend on server. If you're low level on an established server you likely have more problems. I'm level 45 on a young server and the top players aren't much higher than me. I'm 54 and the combo War Chief + Death Knight is really good! I decided to make a Heroes Charge stream, hopefully you can help it grow. 1. Will be Streaming daily at 12:00 CET time. 2. Tips and tricks, discussions with my viewers on chat involving line ups. 3. Tips and Hints involving PVE and PVP aspects of the game! 5. Twice a day showing you how to manage 15/15 Crusade. I'm level 56 and since two weeks I always complete all stages in the crusade mode.